has an excellent website with much more information on bullet molds, reloading tools and related items, as well as membership information. Starting with the first metallic cartridges and continuing through the present, reloading tools have been produced in a staggering variety. 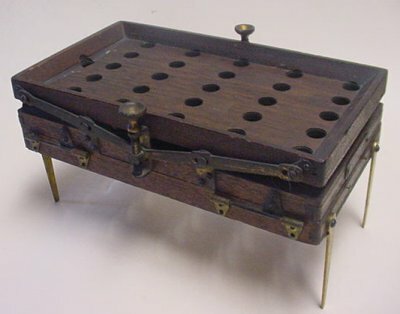 They have always had some appeal to the cartridge or gun collector, or person interested in mechanical devices. 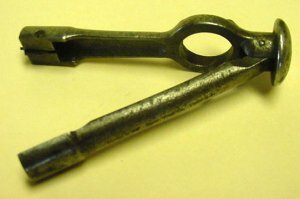 Recently a club dedicated to their study emerged, the Antique Reloading Tool Collectors Association (ARTCA). Although still in the early stages of development, they have an excellent web site and some truly dedicated researchers. 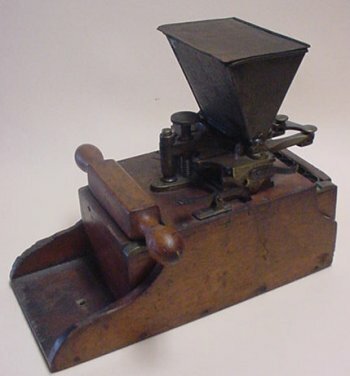 Antique reloading tools can be defined to encompass such things as bullet molds, powder dispensers, powder cans, primer tins, patent reloading devices, catalogs and advertising paraphernalia. They are often colorful, mechanically fascinating, cleverly designed and make a worthwhile adjunct to collecting cartridges or the guns that used them. The following photographs provide an overview to this interesting hobby. (Fig. 1) Near the top of reloading tool scale for rarity is this complex W.Bartram Patent shotshell reloader. (Fig. 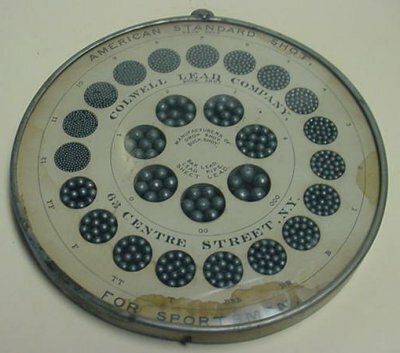 2) Another of the interesting shotshell reloaders, this one patented in 1878 by George Slocum. (Fig. 3) A nice display of American Standard Shot by Colwell Lead Company. (Fig. 4) This compact little pocket shotshell reloader is marked Providence Tool Company and performs all steps necessary to reload a shotshell. (Fig. 5) A selection of bullet molds. 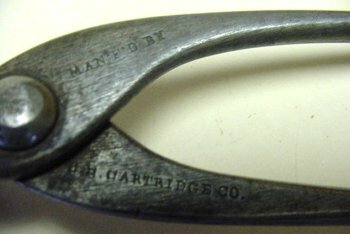 Top to bottom: Remington, Maynard, Maynard, Sharps, Bridgeport Gun Implement Co.
(Fig. 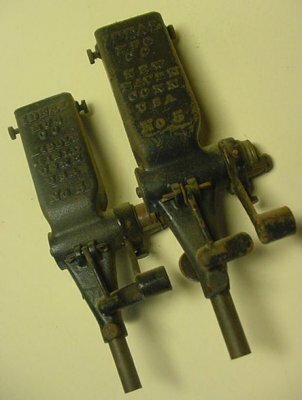 6) Two number 5 Ideal reloaders, the older one stamped New Haven, the later one made by Marlin and marked Middlefield. (Fig. 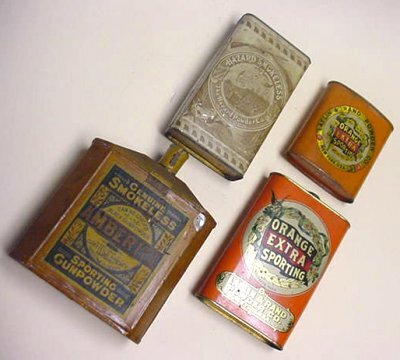 7) Powder cans of the reloading era are usually lithographed and colorful. 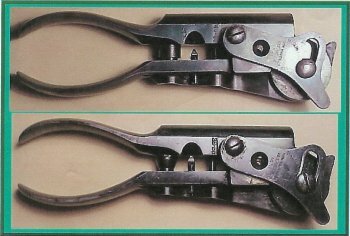 008S-JPG (Fig. 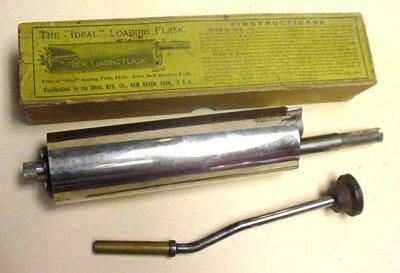 8) An Ideal powder flask/measure and a bullet seater for a single-shot rifle. (Fig. 8) A Whitney style bullet mold marked U.S.Cartridge Company. 010S-JPG (Fig. 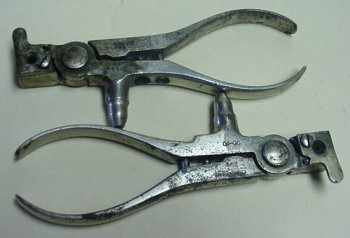 9) A pair of Ideal tong tools in 44-40 and 38-40 caliber. The style with the integral bullet molds are most desireable, especially in popular calibers. (Fig. 11) A pair of Wesson-marked primer tins. The tiny 00 size is very rare and fits the M1882 Maynard cartridge in 22 caliber. (Fig. 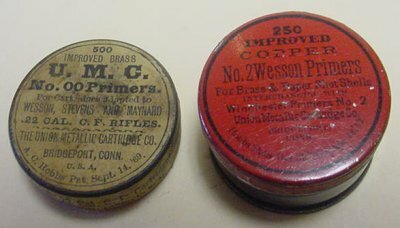 12) A Phoenix primer box for the Evans Rifle and another UMC Wesson tin. (Fig. 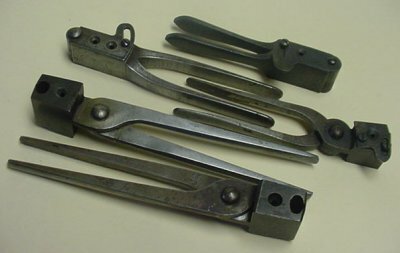 13) Many manufacturers produced elaborate, highly collectable tools. Marlin, Remington, Winchester, Ballard, Sharps, Savage are but a few. This Marlin tool is beautifully made. The ARTCA is in the process of developing a datbase of extant specimens. If you have Marlin loaders in your collection, or have first hand knowledge about them, please submit theinformation so the database will be complete as possible.